Except, somehow, Minecraft wasn't released until today, and thus today is the day it is intended to be reviewed on. It's been in alpha then beta for a couple of years now, with any and everyone who coughed up the eminently reasonable sum of first £10 and later £14 granted immediate access to the latest build and all future updates. There isn't even any mystery around the 'release' version, with a near-finished build having been available for the last week or so. Review Minecraft? Oh, go on, then. Endermen: nightmarish teleporting bastards who are utterly vital to accessing the endgame. 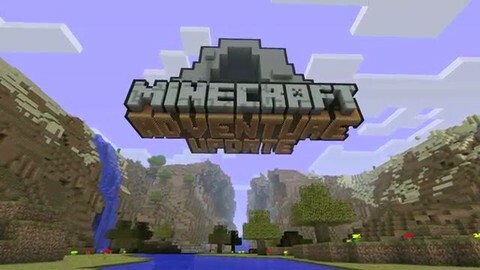 Back to basics: here's what Minecraft, the game, really is. It's a block-based sandbox with two key player abilities: to create and to destroy. With one mouse-button you give, with the other you take away. Hit something - almost anything - with your cuboid hand or whatever tool it holds and, after a few good thwacks, it'll disintegrate. Pick up the debris left behind, and you'll have a piece of building material. You can then drop that in the world, where it'll appear as (usually) a cube. Mine more materials, stack other cubes onto and around your first blocks and, with even the gentlest smattering of imagination, you'll have created something. It could be a giant tower to nowhere. It could be an elaborate Gothic castle with spires that pierce the very sky. It could be an operational minecart and track. It could be a crude phallus. It could be Justin Bieber. It could be almost anything, and that is Minecraft. It is so spectacularly simple in so many ways, and yet capable of being so fiendishly complicated, if you decide to set yourself an ambitious construction project that requires time, patience and ever-rarer types of block. But you don't have to. Be you the most casual clicker or the most diligent digital architect, you will make something of which you feel proud. The game splinters off into two key, additional forms beyond this delightfully minimalist, Lego-like core. One is a multiplayer mode, wherein the patient efforts and bubbling imaginations of a group working together result in what tend to be the most spectacular sights you'll find in this or almost any other game. Find a popular server and you'll see amazing things: impossible cities in the clouds, vast underground mines, waterways carved into functional circuitry, working farms and, yes, quite a few phalluses. Oh no, I didn't mention the animals, did I? Fight 'em, coo at 'em, but most of all harvest, cook and eat bits of them to stay alive in Survival mode. With simple 'recipes' of materials, which thanks to the mildly annoying lack of a tutorial you'll need to look up online or use shape-based guesses to come up with, you can make tools, structures, weapons, fire, portals, doors, ladders, all sorts. Whenever a new block type has been added to the game, Minecraft's building potential has grown exponentially. The endlessly reshapable world, paired with the developers' canny, programming-minded sense of what new block types could theoretically be used for, makes for a wonder of electronic possibility - the fundamental 'what if?' that video games can pose. Of course, most of us will never participate in such grand creations, because we're too lazy and panicky and easily distracted. Most of us will dig a big hole in the ground, stick some torches on the walls and feel like we're home. And that, I think, is Minecraft at its most important. No matter how crude, hapless and infantile your creations, they're yours. The hole in the ground will feel like home, because you're the one who made it, you're the one who couldn't work out the block combination that creates a ladder so built a disjointed staircase to nowhere instead, you're the one who desperately patched up that hole in the roof you accidentally made just as a monster tried to creep in. Ah, the monsters. That leads me on to the other key facet of Minecraft: the one that might be a little less vital to the game itself, but is the zeitgeist-y heart of Minecraft's online fame. Creepers, Ghasts, Endermen, zombies, skeletons, spiders: lumbering and stupid block-beasts, the lot of 'em, but if they see you, they will home in on you and relentlessly try to kill you. Fortunately, they mostly come at night, mostly. In the brief daytime, you build. In the long night-time, you hide. Or you fight. It is about survival - creating first shelter and later weapons and armour to fend off these single-minded, cartoonishly crude and yet effortlessly menacing hunters. Rarer blocks and ever more complicated mining and crafting creates sturdier gear which will keep you alive for longer - although, in most Minecraft modes, death is but an inconvenience that loses you whatever you're carrying and flings you back to the geographical start point. The real loss is your location and whatever precious, precious blocks you were on the verge of mining, which can be hard to find again if you've not been smart about marking locations. One day my son, all this will be yours. If you can be bothered to build it, that is. This final fight is ridiculously and intentionally tough, its reward is an arguably too-big-for-its-boots 'poem' and, well, it just doesn't quite feel in the spirit of Minecraft proper. But it is a concrete goal to aim for, and for some people that may well be necessary: both the kind of player who finds it hard to drag themselves away from the main quest in Skyrim, and the kind who absolutely has to achieve everything. This aspect, and the levelling, seem a long way distant from the simpler virtues of construction and survival that first made Minecraft the internet's darling, and I worry slightly about this toybox of a game staggering under the weight of such additions if more are to come. Then again, these narrative and role-playing elements are entirely optional - as is everything in the game. Just build a tunnel to nowhere if you like. Or yet another rocky phallus, most likely. Minecraft is yours to do with as you please: its single greatest feature is that, every time you start a new game, it gives you a new, random and infinite world, strangely beautiful in its blocky minimalism (very much thanks to truly lovely lighting and music), a new adventure and a new, endless box of digital Lego. Minecraft is a towering achievement in the very possibilities of gaming, and it does this without losing itself to either esoterica or cynicism. It is a game anyone can play and anyone can get something out of, no matter how skilled or imaginative they are. They will make something and they will have an experience that feels like theirs and theirs alone. The last two of years of public-eye development also make for a vital and joyous lesson for modern gaming itself: go your own way, listen to your players, celebrate what human beings can do rather than what you can make them do. Minecraft might be inseparable from its own fame by this point, but one thing's for sure - it deserves every bit of it.